This interesting shot by ButterflyCircle member shows the relationship between what would normally be considered predator and prey. 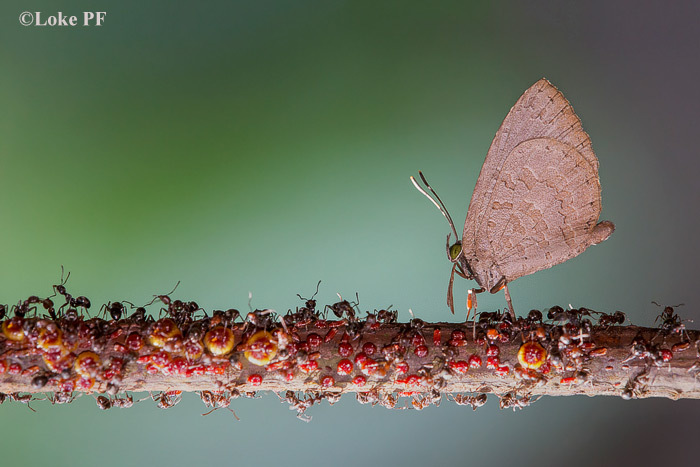 However, for the butterflies that belong to the family Miletinae, there is a symbiotic relationship amongst the butterfly, its caterpillar and the ants and in this case, the scale insects (Coccids) that the ants are 'farming'. In an earlier article on myrmecophily on this blog, more details are discussed. The Bigg's Brownie (Miletus biggsii biggsii) shown here, appears to be "invisible" to the ants, which are busy "farming" the coccids for their honeydew secretions. The caterpillars of the Biggs Brownie also invade the ant-coccid association, by feeding on the coccids. Some other species of the family also feed on the ant larvae as their primary source of food.